• The project represents FM Global’s deep commitment to Asia and support of its clients as they expand their business operations throughout the region. • The 125,000-square-foot (11,610-square-meter) building will feature the FM Global Asia SimZone, offering hands-on education to clients, partners, industry and government officials in Asia. This S$80-million, 125,000-square-foot (11,610-square-meter), six-story building will feature the FM Global Asia SimZone, offering hands-on education to clients, partners, industry and government officials in Asia. SINGAPORE—FM Global, one of t­he world’s largest commercial and industrial property insurers, today broke ground on the construction of a new loss prevention training and operations center, located in the Singapore Science Park, a research, development and technology hub in Singapore. A groundbreaking ceremony marked the start of the construction phase for the six-story, 125,000-square-foot (11,610-square-meter) facility that will house the FM Global Asia SimZone, the company’s first hands-on training facility in Asia, and the first of its kind on the continent. 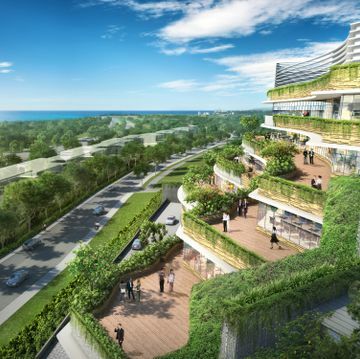 The S$80-million building will be constructed by Ascendas-Singbridge, Asia’s leading provider of business space solutions, and is expected to be operational in early 2019. “Over the course of FM Global’s 35 years of operating in Asia, we have seen that companies in the region are very interested in increasing their resilience to risk, thereby enhancing their ability to maintain positive business performance when disaster strikes,” said FM Global’s president and chief executive officer, Thomas Lawson. “The new center will house an array of one-of-a-kind learning facilities to provide experiential loss prevention education, at no cost, to our policyholders as well as to building designers, contractors, students, educational institutes, insurance brokers and government officials. The facility will leverage our nearly two centuries of loss prevention engineering and client experience and expand our insurance and engineering operations in Singapore into full-fledged education,” added Lawson. A key focus of FM Global’s business will continue to be helping companies become more resilient by providing them with a better understanding of the property hazards that can affect their business continuity and delivering the best loss prevention advice based on scientific research and engineering, rather than solely relying on insurance for protection. The center aims to extend these services with training facilities that help the business community on the continent thrive by increasing their appreciation for resilience and knowledge of how to effectively reduce their property risk exposure. Interactive laboratories and learning areas will allow the safe simulation of property risks, such as natural hazards, fire, ignitable liquid, construction, electrical hazards and industrial equipment malfunction, in a protected environment to help visitors better understand how local hazards can be mitigated. “Singapore is a natural home because the company shares a like-minded belief with the Singapore government on the value of resilience,” said Stefano Tranquillo, senior vice president of FM Global’s Asia-Pacific division. “Asia also is a region with frequent and severe natural hazards, such as windstorms, floods and earthquakes, and given that sound loss prevention practices in this part of the world are hard to come by, businesses are not always operating at the highest possible standards of risk management. As such, we are looking forward to forging mutually beneficial collaborations, including partnerships with institutes and governments through the establishment of this center, which will ultimately benefit Asia and its trading partners across the globe,” said Tranquillo. FM Global has established partnerships with educational, technical and governmental organizations around the world, including the Institute of Catastrophe Risk Management, which serves as a trusted advisor to Singapore and other governments in the region. As a result, local businesses stand to benefit directly from FM Global’s physical presence in the region and from the opportunities the company’s working relationships in Asia provide.